This is a good indicator as the major inflows is through foreign sources. 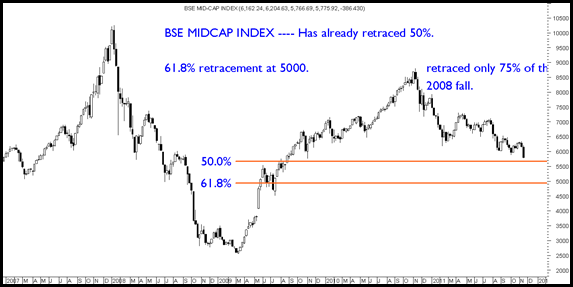 The index did not cross the 2008 highs and could only recover 80%. At the same time it has already retraced 50%. 61.8% retracement is placed at 2300. So a quick look at it would say Sensex has done 14500 in dollar terms. This is where majority of the portfolios are focussed at for retailers/HNIs as well as funds. This index could not recover the fall of 2008. This is one of the best indicator of panic in the markets. Index is down to 61.8% of the current rally of 2009-2010. So we may expect it to bottom out at 5100 in panic. Similar levels for Nifty are 4300-4400 for 50 % retracement. 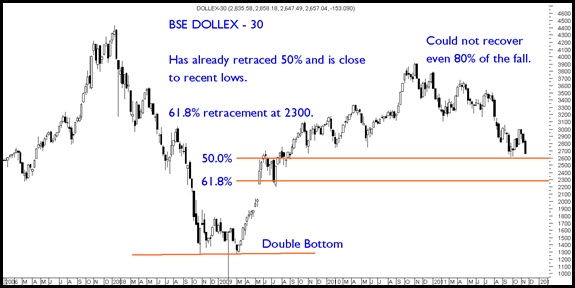 The downtrend in the index which started post the breakdown below 19900/19000 remains in place. This will not be reversed till we get into a strong consolidation. Also generally we see stocks hitting 20% down circuits/ panic falls/ end of day selling / sharp drops with moderate volumes/ bankruptcy rumours either in the middle of a bear market or by the end of it. So we are witnessing quite a lot of such scenarios. In such a period there is no point being brave and buying stocks which are falling – ( for example crompton, lnt may be great companies but the way they are falling it wont be a wise decision to go for bottom fishing. One may also keep a strict stoploss even if its an investment position or buy in very very small sizes and spread your buying ). The reason to not jump in is PANIC has no LOGIC. Focus on quality stocks where there is a good amount of margin of safety or stay on high cash. We have been slowly deploying cash whenever index goes below 4950 with a view to be able to complete buying by 4500-4400. Also the stocks on radar are solid companies like Godrej Inds, Aditya Birla Nuvo, Smartlink, NESCO and some more. 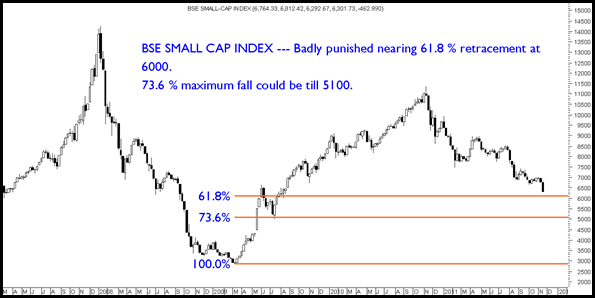 Rest continue to have a bullish view on large cap cements and may look to re-enter on dips if at all they correct. One of our favorities HUL did 400 as expected and one may now look towards Cements to be a defensive segment. The approach should be to conserve capital and be very selective as i believe many stocks may look cheap but they might be dirty :). VIX is kind of holding itself. Is it an indication that people have figured in most of the panic? VIX is still trading above 25 which is pretty high in normal scenarios. But still in the current environment its fine. Well when we hit 40 Vix we have factored in the most of panic. Only case is if we see a blackout way bigger then 2008 !! What is your take on Coal India at current levels? My take on Coal India as per market buzz is to buy around 280-290 and in panics to 250-270 if at all it comes. Can Ramco Industries be picked at 44-45 as i am stuck up at 70. Pl advice on buying levels for ICICI Bank and Axis Bank. I am not tracking ramco inds of late. I would still wait for taking a major plunge into banking stocks. Rather it would be to buy on dips. 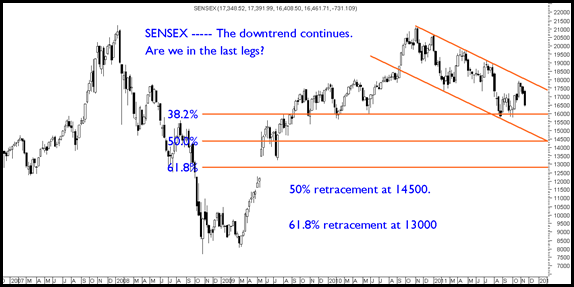 The target of 4500-4400 on the nifty is intact or can be lowered because of the momentum in the negative direction. The fundamentals of Sugars are very difficult to understand but the cycle has to change some quarters down the line. So one may look towards balrampur as they did a good buy back indicating at least company is positive.